Vienna 2012: Celebrating Gustav Klimt on his 150th Anniversary! Dürer on display in his home town, My Very Own Dürer Experience: Coming to War Torn Europe in the 1950s, My Dear Late Friend: Matthew Matthias Prechtl. Two museums from Berlin's postwar years as a divided city: The Stasi Museum and The DDR Museum. The Good News is that the Missing Head of the great Herkules Denkmal that stands high above the City of Kassel has been restored! Europe's Gardens & Palaces/Danger in Wörlitzer Park Grotto & Labyrinth/Huge DDR Power-Plant on Display/Saxon Strongholds--Königstein & Bastei/Stolen Quedlinburg Treasure Returned/1200 Years of Archbishops in Salzburg/Austria's Mauthausen Death Camp/Graf Zeppelin's Blimp Museum/Bayreuth Opera-House Has 250th Birthday/Taking a Bath in Baden-Baden/Secrets of Mysterious Rosslyn Chapel. Rambling over seven hills--like Rome and San Francisco--Portugal's capital city is one of Europe's most beautiful and most unusual. In this EXPO year, hordes of tourists are expected from all of its sister nations in the European Union. 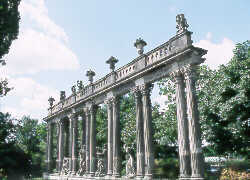 All of which have impressive pavilions on view at the fair site. Not to overlook the hundreds of thousands--millions even--which are hoped for from around the world. But, after having made Herculean efforts to improve transport and cultural venues in the city itself, Lisbon is hoping tourists won't neglect its own indigenous attractions. The truth is that Lisbon and Portugal provide the last real "affordable" holiday in Europe. Becoming Europe's Culture City in 1974 gave Lisbon a good excuse to spruce up many of its marvelous historic churches, palaces, monuments, and residences. And now that historic restoration is really paying off. 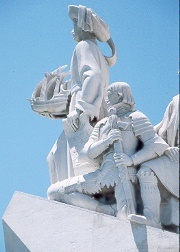 So this is an excellent time to explore this remarkable city, EXPO '98, and the "Undiscovered Country" that is Portugal. 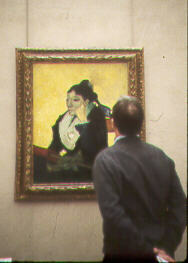 STUDYING VAN GOGH'S "WOMAN OF ARLES" IN THE MUSÃ‰E D'ORSAY. Photo: Copyright ©--Glenn Loney 2000/The Everett Collection. Paris' Orsay Museum--From Train-Station to Art Archive/Theo van Gogh as Art Dealer & Collector/Dazzling Colors in Fauvist Show at Paris MoMA/Women Painters at Paris' Académie Julian. 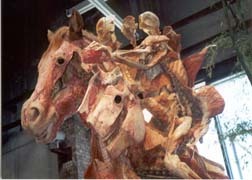 HORSE & RIDER--Both Animals and Humans can be preserved and dissected with the Plastination Process. See: "Who Says You Can't Take It With You?" Your Body Need Never Decay,You Can Always Be on Display,Preserving Corpses with plastination,anatomy art,Big Jeff Koons Comeback in Bregenz,Art & Culture Between Alps and Lake Constance. 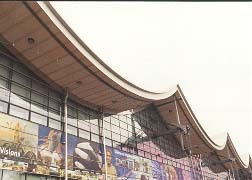 PLANET OF VISIONS--Major Theme Pavilion at EXPO 2000. Photo: Glenn Lone. EXPO 2000 in Hannover/Peter Stein's "Faust" Epic/"Gilgamesh" Opera Premiere/Baroque Herrenhausen/Eight Plays in One Hannover Evening/Post-Modernist Mozart at Frankfurt Opera/Monumental "Trovatore"/Rosalie's "Dandelions" in the Palmengarten/Hundreds of New Shows Set for Edinburgh Fringe. Somewhere in Northeastern Brazil, a cowboy posing to mark a religious feast day. "Brazil: Territory, Land, Work, Culture" is no traditional history lesson. This impressive colorful new book could be added to your library. A wide exposure of this volume should also rapidly increase the numbers of North Americans who will book flights to Rio, outings to Brazilia, and boat-trips up the Amazon. An excellent introduction to the World that is Brazil--and of Brazil to the World--it was originally published solely for distribution through Brazilian Embassies and Consulates. Its purpose was--and is--to reach as wide as possible an audience of people interested in learning more about Brazil: especially teachers and "opinion-makers." Our reviewer, Glenn Loney, tells you how to request a copy. Disney's Tarzan Tickets, or the sold out Jersey Boys Tickets being played at August Wilson Theater in NYC.